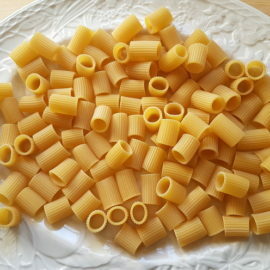 Fusilli Bucati, the pasta with a hole! Some people spend ages browsing in book shops but I spend a lot of time in the pasta aisles of Italian supermarkets. Big Italian supermarkets have long pasta aisles not just small sections,and I love them! 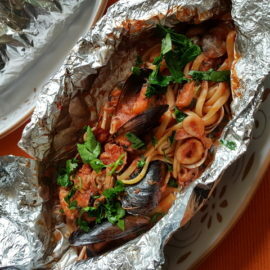 I often discover a new type of pasta or one I’ve never cooked before or one I’ve forgotten about and take a packet home to add to the others in my larder or fridge (if it’s fresh) ready to be cooked in the near future! So that’s how I came across this unusual hollow pasta; browsing along the pasta aisle! 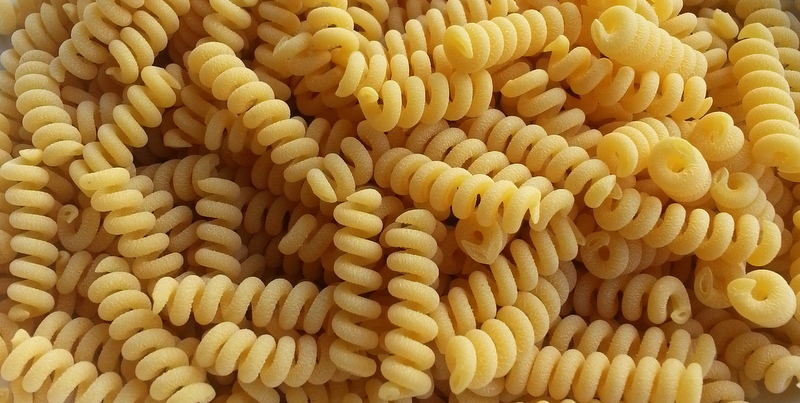 The traditional type of fusilli were originally handmade .The spiral, corkscrew shape was obtained by twisting a thin rope of pasta dough around a long needle or thin rod using a particular method which was reminiscent of spinning. 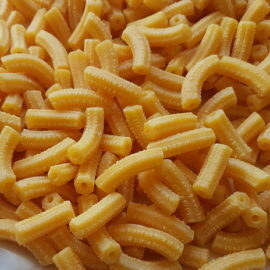 In fact, the name ‘fusilli’ comes from ‘fuso’ which means spindle. I read that it was actually two Italian-Americans who developed the first machine for the industrial production of fusilli in 1924. 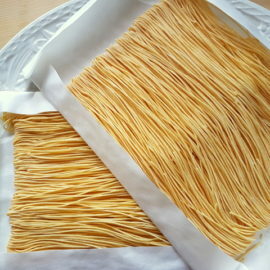 The introduction of industrial processing techniques subsequently enabled pasta makers to make different types of hollow pasta. 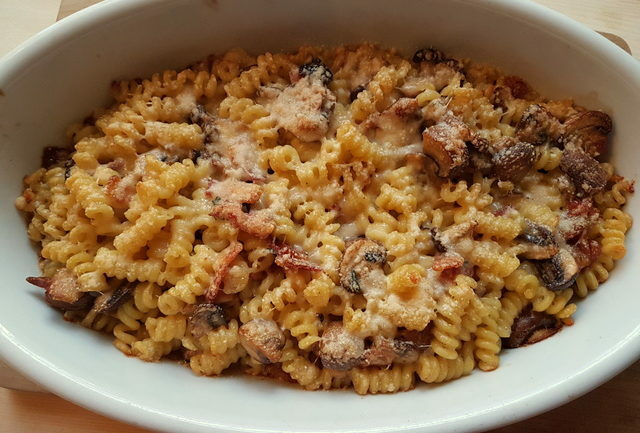 Fusilli bucati corti with Gorgonzola, pancetta (bacon) and mushrooms. 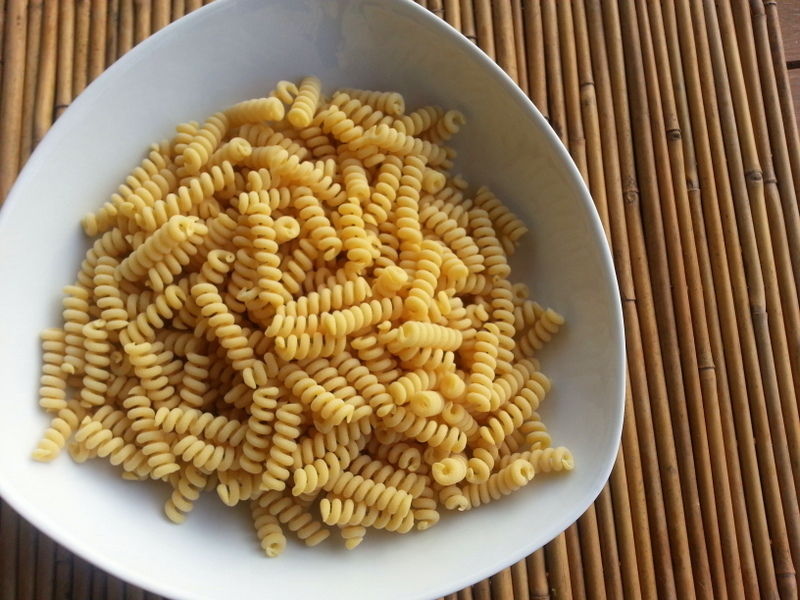 Fusilli bucati corti are a very attractive type of pasta, which maintain its shape well with cooking and therefore contributes towards the visual beauty of the dish it is used in. 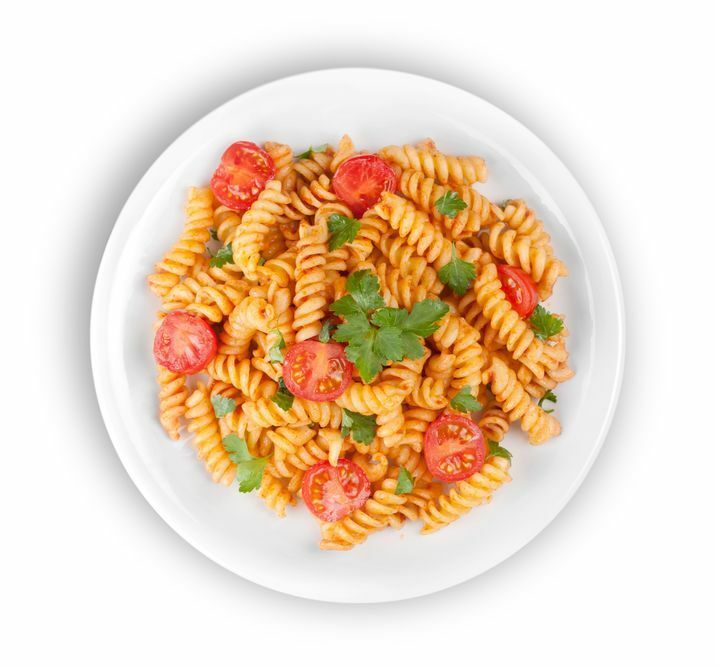 More importantly however, short fusilli bucati are very versatile and can be baked, used in pasta salads or served with vegetable, fish or quite heavy sauces such as Bolognese or other meat sauces. The hole actually enables the sauce to get a bit into the pasta making every mouthful yummy! If you like baked pasta dishes you can give this pasta a try baked with Gorgonzola, bacon and mushrooms. Absolutely delicious!